When used to nominalize the preceding clause, the nominalized phrase expresses a fact which is already accomplished or which the speaker supposes will be accomplished. 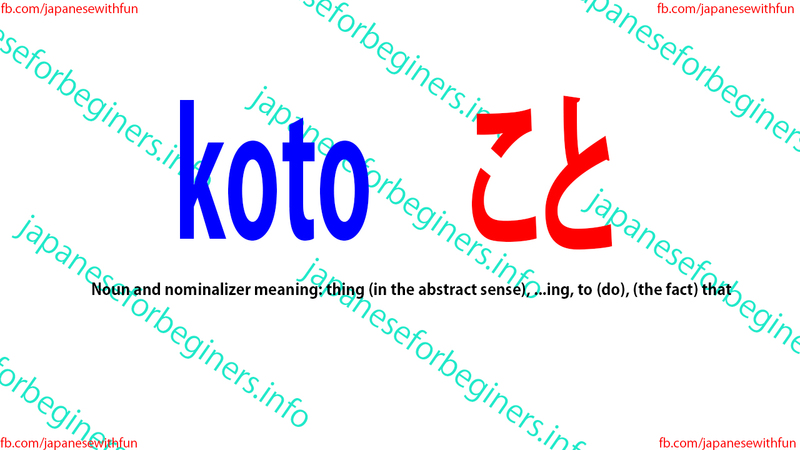 koto tends to be taken as an object by verbs of mental activity such as knowing, recognizing, understanding, hoping, learning, etc. Kanojo no koto wa yoku shitte imasu. Kyou wa suru koto ga takusan arimasu. Miru koto wa shinjiru koto desu. 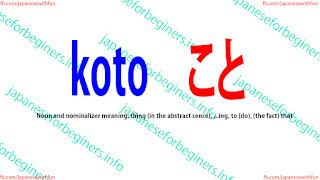 Yoku yasumu koto ga hitsuyou desu. It is necessary (for you) to get enough rest. Nihon wa bukka ga takai koto wa yoku shirarete iru. It is well known that prices in Japan are high. Watashi ga itta koto o kare ni tsutaete kudasai. Please tell him what I said. Sachiko san ga youroppa ni itta koto o shitte imasu ka. Did you know that Sachiko has gone to Europe? Shikichi nai ni hairanai koto.